I couldn't think of another name for this post so I just translated the meaning. 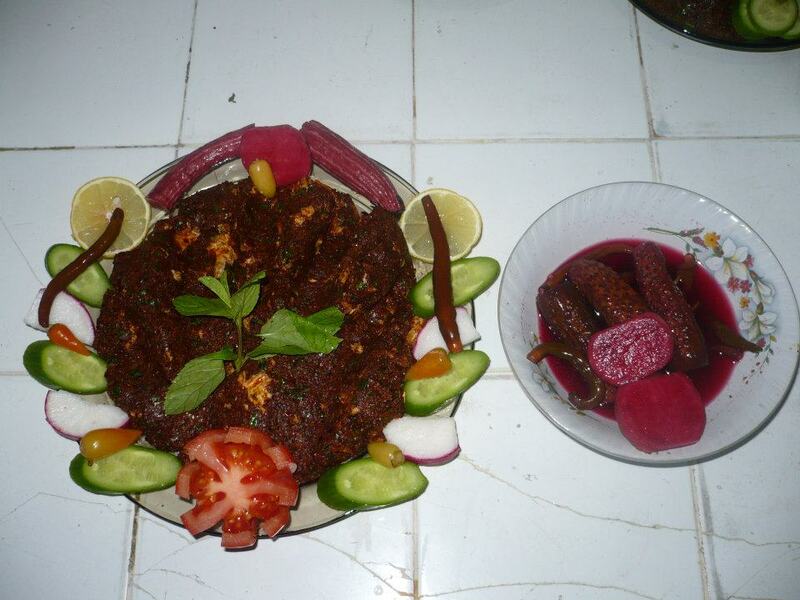 This is a very famous dish from Sanli Urfa. This is a Kofte(meatball)recipe using red meat that you form into the kofte's but you don't cook them after, so the meat is left raw. There are other variations that I will post substituting the meat with walnuts. The photos come to me courtesy of Ahmet Usta from Urfa Cig Koftesi Sevenler. Ahmet Usta has a facebook page that I came across with some great photos. I contacted him and asked if he would mind me using some of his photos he most graciously responded saying I could. This is an easy recipe to make with the process being straightforward. 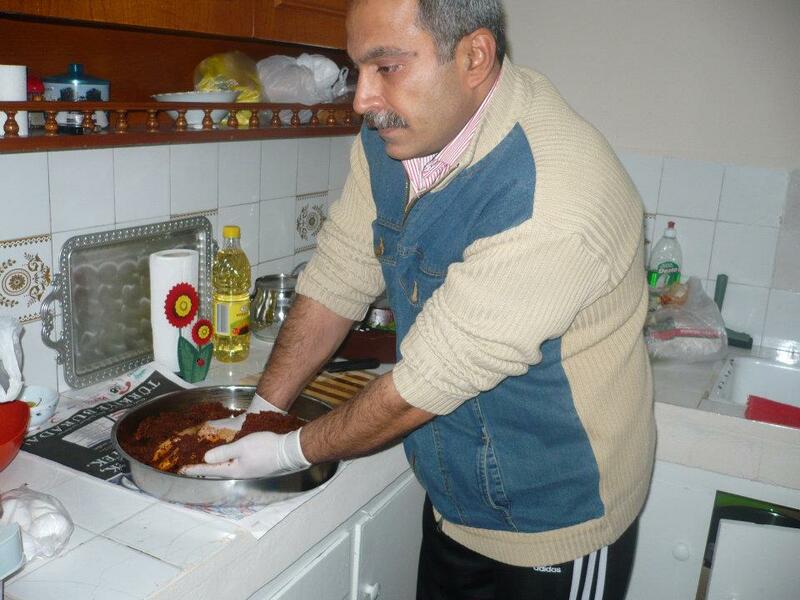 If you are Turkish there is alot of tradition around making it and I have only seen men making this dish. 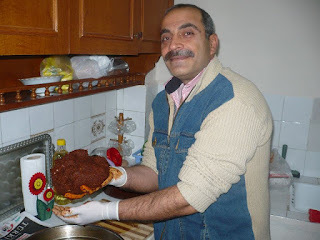 There is also quite alot of kneading involved and you probably need about 30 good minutes to do the job properly or if you are like me doing it in a food processor is quite acceptable as long as your Turkish guests are none the wiser. I'll show you the photos first followed by the recipe. This recipe can have some variations with the meat with these photos showing the use of egg. 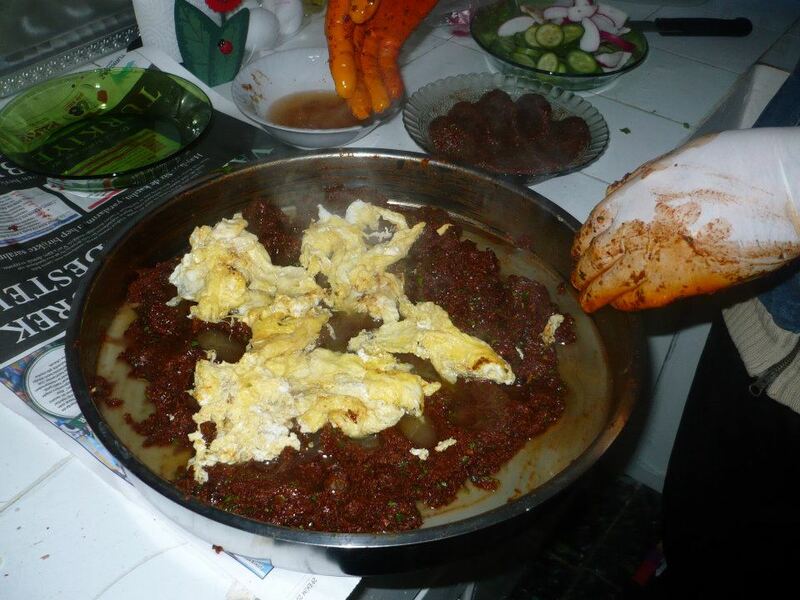 The cooked egg is kneaded in with the bulgur, meat mixture then formed. The story for this food goes that Abraham had caught a deer that he gave his wife to make food for him. Nothing could be found to make a fire and this is the dish she came up with. I am sure thousands of Turks would love to thank her for this very popular dish. Put everything into your food processor until well mixed. Slowly add in small amounts (tbs) water and keep processing until you get a consistency like the photo. If you want to add in the egg cook a couple of eggs in the fry pan and mix in. If you want to do it the hard way add everything together and knead for 30 - 45 minutes with Turkish music on in the background to keep you focused. You can serve like the photo which is on a plate or make into individual portions (meatball size). This is nice with Ayran. I love how different cultures have different stories behind their food. Very nice of the man to let you use his pictures. You are mentioned on my blog today!! Yes it was nice of him and I have taken several more and those will also be used on my blog - I will just have to pop over there and take a look at what youve been saying. This sounds quite nice, especially if served really cold. The cooked egg is a suprise, I would have expected raw egg mixed through. I have eaten it but its the texture with me but does tastes lovely especially if you like hot things. You can omit the egg if wished as well. I really appreciate the passion with which you made these koftas...these look scrumptious! Even in India, we have a number of Koftas. I loved this recipe!! Thankyou, I really like Indian food and try to eat it as often as I can. 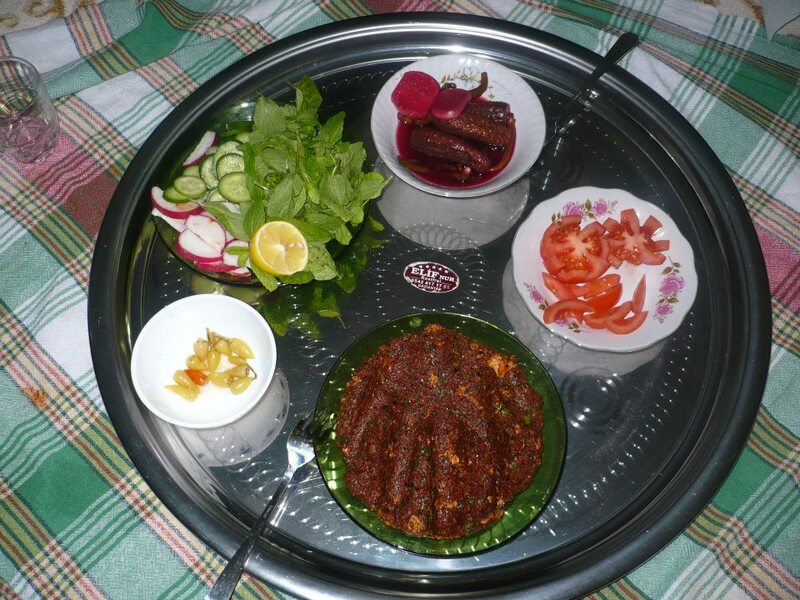 There are alot of similarities between dishes in the Indian Turish cuisine. The Indians using more spices more arromatics than the Turks. This looks and sounds amazing!! Nice post.